Development doesn’t always bode well with the environment, but experts say newer projects like The Wharf could do more good than harm. Here's how. WASHINGTON — In the last decade, D.C. has seen an explosion of development. Downtown and in neighborhoods inching east, cranes seem to be a permanent fixture in the city’s skyline. But nothing has been as big of a project as The Wharf. The massive development encompasses a mile of shoreline, 24 acres of land and 50 acres of water. 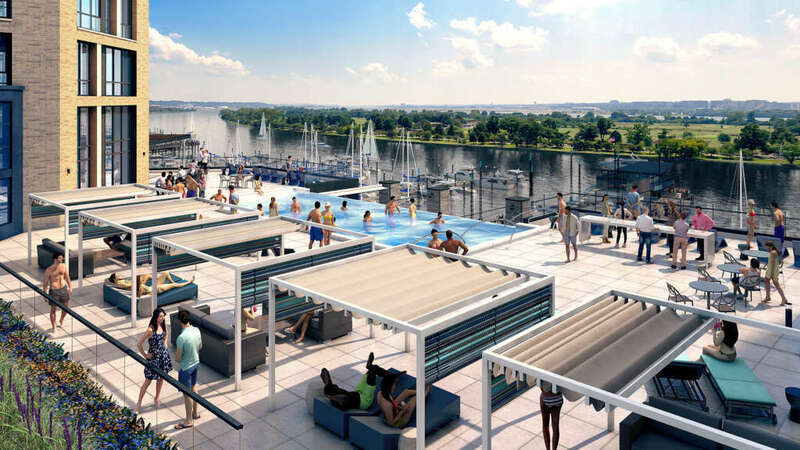 When the first phase opens next month, the new neighborhood will be home to three hotels, more than 20 bars and restaurants, multiple music venues, retail shops, office and residential space, a 309-slip marina, plus several parks and piers. Then, there’s Phase 2, which will bring an additional 1.15 million square feet of mixed-use development across a half-mile of waterfront. Although all of the activity will no doubt benefit residents and the local economy, development doesn’t always bode well for the environment — including the city’s rivers. According to the U.S. Department of the Interior, urban development can increase runoff, erosion and sedimentation, and cause the levels of nitrogen and phosphorus in a body of water to rise. Hedrick Belin, CEO of the Potomac Conservancy, said a polluted river isn’t just bad news for aquatic life; it’s bad for everyone. 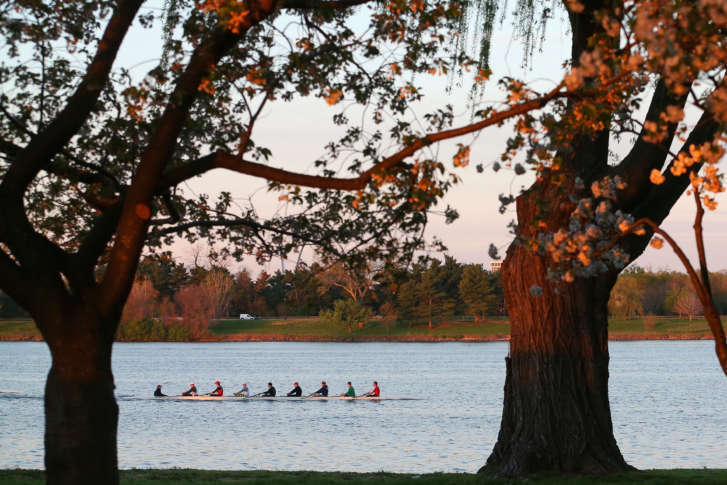 “One of the reasons (a clean river) is really important is that for most residents in the D.C. metro area, when you turn on your tap at work or at your house, you’re drinking Potomac River water,” he said. Dirty waterways also prevent people from recreating — kayaking, paddling and swimming — on the river. Can clean development produce cleaner water? Each year, the Potomac Conservancy tracks the health of the Potomac River, and Belin said the organization has recently seen improvement. In 2016, it gave the river an overall grade of a B-, up from a C in 2013 and a D in 2011. “We’ve seen pollution levels decreasing, we’ve seen fish populations increasing, and that’s a real positive sign,” he said. More developers are incorporating architectural features that mimic mother nature, such as green roofs and other porous surfaces, to help capture rainwater where it falls, preventing runoff. Some buildings install holding tanks that collect even greater amounts of rainwater and treat it — “rather than just have it get pumped, untreated, into our local creeks and streams,” Belin explained. 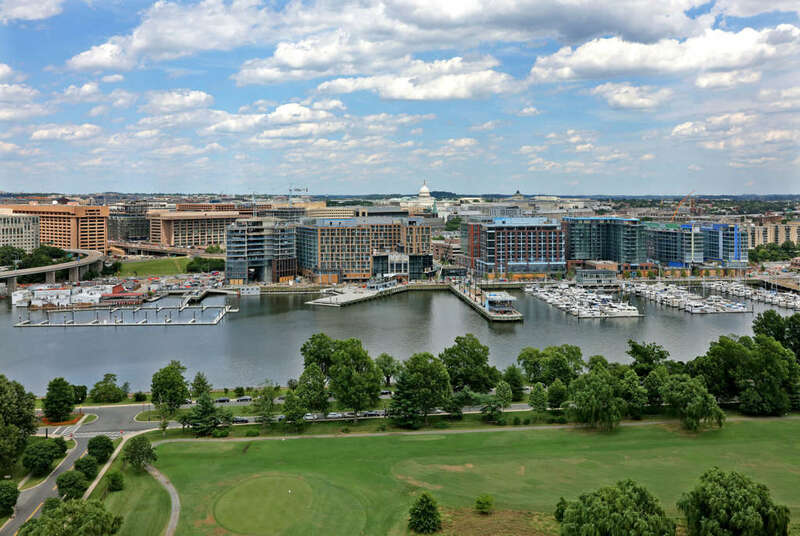 Green roofs and holding tanks are two features that Monty Hoffman, CEO and founder of PN Hoffman, the leading development firm behind The Wharf, has instituted along the Southwest Waterfront. The project also boasts 14 acres of public parks with more than 300 new trees. “Pound-for-pound, trees are nature’s Brita filters, so they’re outstanding when it comes to capturing the rainwater and absorbing the pollution before it flows into our rivers and streams,” Belin said. A floating wetland system and LEED Gold-designed buildings, many of which have solar panels and energy-efficient lighting, are also features of the development’s sustainability efforts. “We’re the mother of green over here,” Hoffman said. According to Belin, consumer demand, economic incentives and stricter government regulations have fueled the trend of sustainable development in the District. The U.S. Green Building Council reports that D.C. has more LEED-certified projects per capita than any other state. “I think this development — and actually, it’s a redevelopment — is really important because it shows others what is possible,” Belin said about The Wharf. 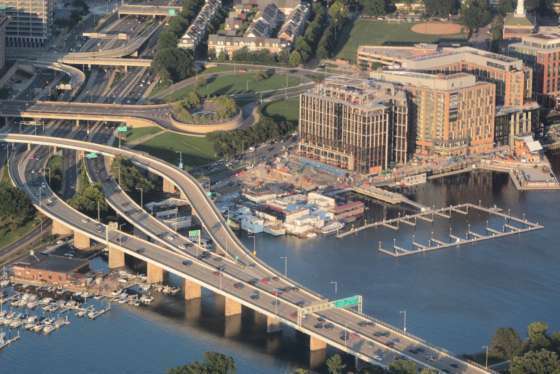 Before Hoffman’s redevelopment of The Wharf, the Southwest Waterfront shoreline sat, for the most part, unused for decades, despite its proximity to the National Mall. “On the water, here, where we developed, was really large, flat, plain parking lots and clubs that were left here. That was sort of a tired, old-school use for the water,” Hoffman said. Hoffman is expecting the The Wharf to attract about 15 million visitors each year, and he sees that as 15 million opportunities to show off the Potomac and raise awareness about the importance of keeping it clean. “The Potomac River is our greatest natural resource, and I think when people see it and they get on it and they’re part of it, aware of it, then the conscious level of cleaning it up and doing other things in our environment goes way up,” he said.